Good morning. I am delighted to join you here today for the opening of the Asian Family Summit co-organised by the Consortium of Institutes on Family in the Asian Region, the University of Hong Kong's Faculty of Social Sciences, the Hong Kong Council of Social Service, the Family Council and the Social Welfare Department. Since this is the first occasion of my attending a HKU function with Professor Zhang Xiang as Vice Chancellor, let me extend to him my warmest welcome and wish him all the best in leading this prestigious university, my alma mater, to new heights. 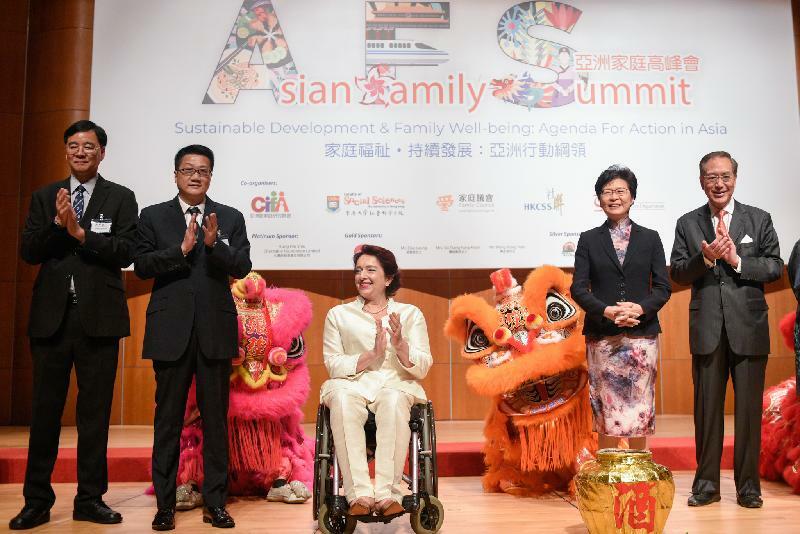 I attended the Family Summit organised by the Consortium of Institutes on Families in the Asian Region in 2014, and came away deeply impressed by the passion of its participants. They clearly reflected the Consortium's watchword, that "family well-being is the root of a harmonious and stable society." This four-day Summit welcomes over 500 professionals, academics, community leaders, government officials and NGOs from all over the world. 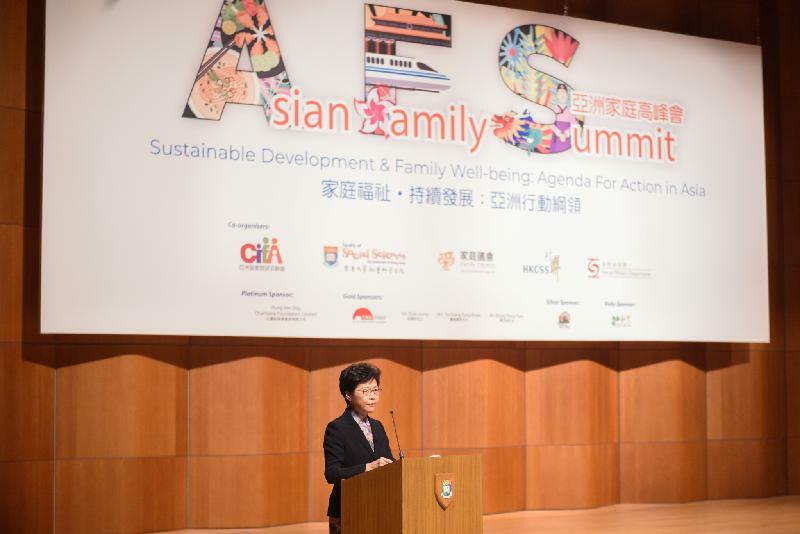 They gather here in Hong Kong to devise an agenda for action in Asia to promote "Sustainable Development & Family Well-being", a theme that echoes well with the United Nation's 2030 Agenda for Sustainable Development. In this connection, we are privileged to have with us Ms Daniela Bas from the United Nations, who will share with us later this morning her insights on the 2030 Agenda. Before I talk about the Hong Kong Special Administrative Region Government's policies on promoting family well-being, let me just tackle the aspiration for sustainable development. Earlier this year when I attended the World Economic Forum at Davos, I was introduced to the inclusive development index, IDI, which was designed as an alternative to gross domestic product to reflect more closely the criteria by which people evaluate their countries' economic progress. Such an analysis was prompted by the emergence of a worldwide consensus on the need for a more inclusive and sustainable model of growth and development that promotes high living standards for all. As a matter of fact, we have seen how slow progress of such and widening inequality have contributed to political polarisation and erosion of social cohesion in many advanced and emerging economies. In the midst of a divisive and polarised society, the well-being of families would be harder to safeguard. Thus, at a more macro level, I attach importance to building Hong Kong into a more inclusive society, socially, economically and politically. I accord priority to the Government devising more proactive social and economic policies to provide more opportunities for people from different backgrounds and adopting a more caring and interactive approach in engaging various sectors. When it comes to improving people's livelihood, I pledged in my maiden Policy Address delivered last October that my Government would be "pro-child, pro-family, pro-work and pro-user." We have a good foundation to build on. Established in 2007, the Family Council has worked assiduously across bureaux and sectors to examine family-related policies and develop a loving family culture. 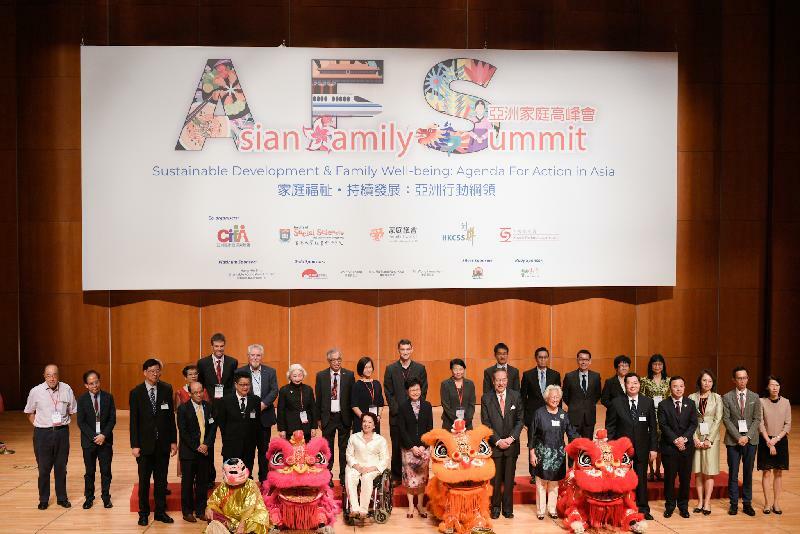 With the efforts of the Family Council, Hong Kong today is a leader among Asian societies in applying family-impact assessments to policy-making. Indeed, including the family perspective as a factor in policy formulation has been a mandatory requirement for more than five years now. And soon all Government bureaux and departments will embrace an even more comprehensive checklist in assessing the impact of public policies on families. I'm sure Daniel, the current Chairman of the Family Council, will have a good deal more to say on this topic in his session tomorrow morning. Every policy that affects individuals and communities will also have implications for families. The United Nations has focused its major goals under the 2030 Agenda for Sustainable Development on the elimination of poverty and hunger, on promoting well-being for all at all ages, for improving work-family balance and achieving social inclusion. Allow me now to outline my Government's work in these areas, all closely connected with family well-being. On poverty alleviation we have put in a lot of resources over the past few years. Spending on social welfare has surged by over 86 per cent in the past six years, with a range of initiatives on social security pioneered by the Commission on Poverty, which I chaired during my time as the Chief Secretary for Administration, for some four years. And since I assumed the position of the Chief Executive, we have continued to find ways to improve those initiatives. One example is enhancements to the Working Family Allowance introduced earlier this year, with a view to benefiting more families and encouraging self-reliance. Dr CK Law, our Secretary for Labour and Welfare, will have more to say on this in his plenary session later this morning. Good work-family balance contributes to quality family life. In this regard, our Family Council has been organising a biennial Family-Friendly Employers Award Scheme since 2011. I will leave it to Mr Lee Luen-fai, Convenor of the Sub-committee on Promotion of Family Core Values and Family Education in the Family Council, to tell you more about the diversified family-friendly employment practices being adopted in Hong Kong at his concurrent session tomorrow. I would only add that our Labour Department has been actively encouraging employers to adopt employee-oriented human resource management measures and family-friendly employment practices. In addition, my Government is working to increase statutory paternity leave, and is conducting a review on statutory maternity leave. And we will not lose sight of the thousands of non-ethnic Chinese living in Hong Kong, including more than 80 000 South Asians. We are aware that some have encountered difficulties in adapting and integrating to Hong Kong society, largely because of language barriers and cultural differences. My Government is determined to ensure that they have equal opportunity and to accelerate their integration into our community. Indeed, in the enhanced Family Impact Assessment Checklist which all government officials will soon be required to respond to in policy formulation, there will be an explicit item to ensure that they respect, address and balance the needs, values and behaviour of families from diverse backgrounds. Ladies and gentlemen, what I have just mentioned shows that family-related work is multi-faceted. The Government would not be able to do it all alone. On the provision of social services, it is important to promote cross-sector and cross-profession collaboration as well as public-private partnership to make better use of our resources and provide more comprehensive care for the needy in society. In this process, we need a shared belief to drive actions. In this regard, the family core values as identified by the Family Council - "Love and Care", "Respect and Responsibility" and "Communication and Harmony" will be guiding us through the way. My thanks to all the organisers, and the people behind them, for the excellent programme you have put together, and for your unwavering dedication to family well-being. Allow me, as well, to take this opportunity to congratulate the Consortium on its 10th anniversary. Finally, I wish you all a memorable Summit here in Hong Kong. Thank you very much.